Crypto is overwhelmingly libertarian, as am I. However, those who tie the libertarian agenda to cryptocurrency – to use the latter as a direct, head-on means of undermining state or corporate power – do both a disservice. Because, y’know, most of the world isn’t libertarian. 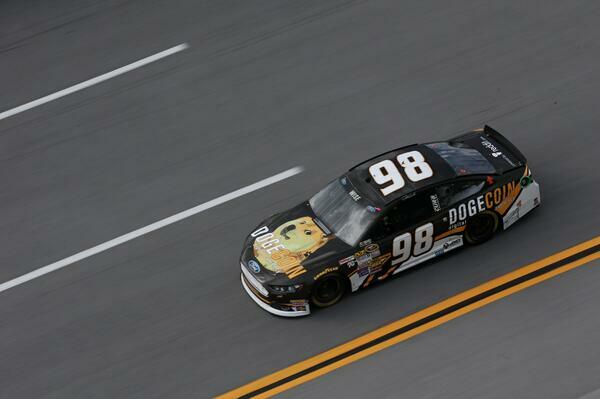 To that end – good luck today, Josh Wise! The multitude is rooting for you. The first crowdfunded NASCAR, No. 98 “Moonrocket,” in qualifying on 3 May 2014. **Note: I have seen, and an earlier version of this blogpost had, these words attributed to Martin van Buren, eighth President of the United States. It didn’t sound like a very presidential utterance so I did a bit of digging; as it happens, the quotation appears in Emmanuel comte de Las Cases’ Memoirs of the Life, Exile, and Conversations of the Emperor Napoleon (1835), published before van Buren was elected President and the words’ appearance in van Buren’s notebooks. So that settles that. Previous Post A serious Analysis of Dogecoin — Or: Why I am all-in on dogecoin.